or their equivalent examinations in foreign countries shall be considered as foreign students. (c) Candidates must have passed Higher Secondary or its equivalent examination with minimum "A" grades or 70% marks in Mathematics, Physics, Chemistry and English. If the transcript contains both letter and numerical grades, then the letter grade will be considered. (d) Candidates passing the GCE "O" Level and GCE "A" Level must earn minimum of B grade in at least five subjects (including Mathematics, Physics, Chemistry and English) in GCE "O" Level examination and minimum of A grade in each of Mathematics, Physics and Chemistry in GCE "A" Level examination. (e) Candidates willing to be enrolled in Biomedical Engineering Department must have obtained in Biology a minimum of “A” grade or 70% marks in the Higher Secondary or its equivalent examination, or a minimum of “B” grade in GCE "A" level or its equivalent examination. (f) Candidate having S.S.C and H. S. C. or their equivalent examinations (i.e not GCE "O" and "A" level) must have a minimum IELTS score of 6.0 or a minimum TOEFL score of 60. 2. 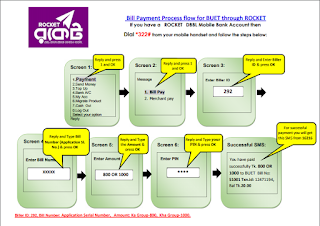 Visit: http://ugadmission.buet.ac.bd/index.html and To Right Corner Click 'Apply Online'. 4. Print the applicantion form and note down the biller ID. 5. Complete the payment in DBBL mobile Banking and SureCash . After complete the payment successfully reserved the transaction ID and visit www.buet.ac.bd put your application ID and Transaction ID and submit and download your admit card. BUET authority will published on 26 September, 2017 List of Eligible Candidates at http://ugadmission.buet.ac.bd/. 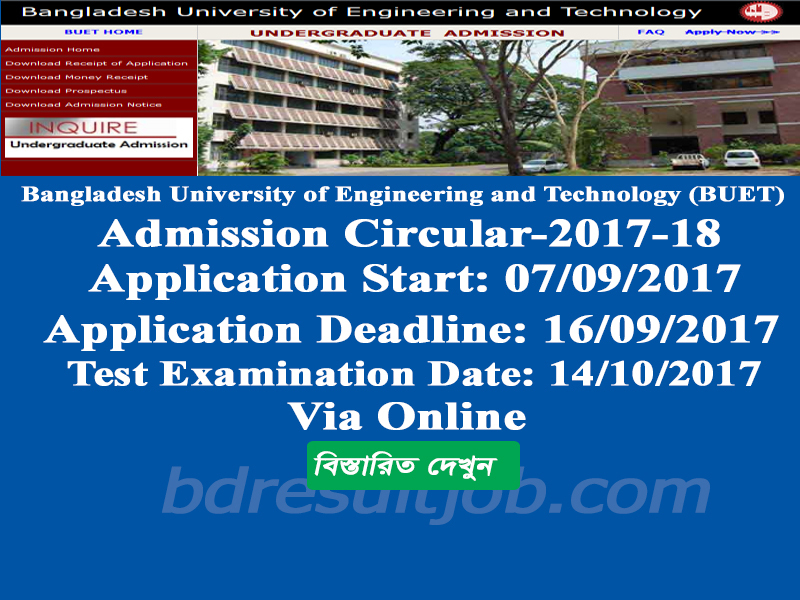 Bangladesh University of Engineering and Technology (BUET) 07 October 2017 Download Admit Card. You are Eligible Candidates candidate you can download http://ugadmission.buet.ac.bd/ by clicking the link “Download Admit Card”. S/he must then print this admit card on A4 size offset (80 gsm) white paper and keep it safe. A candidate shall not be allowed to enter into the examination hall without an Admit Card. 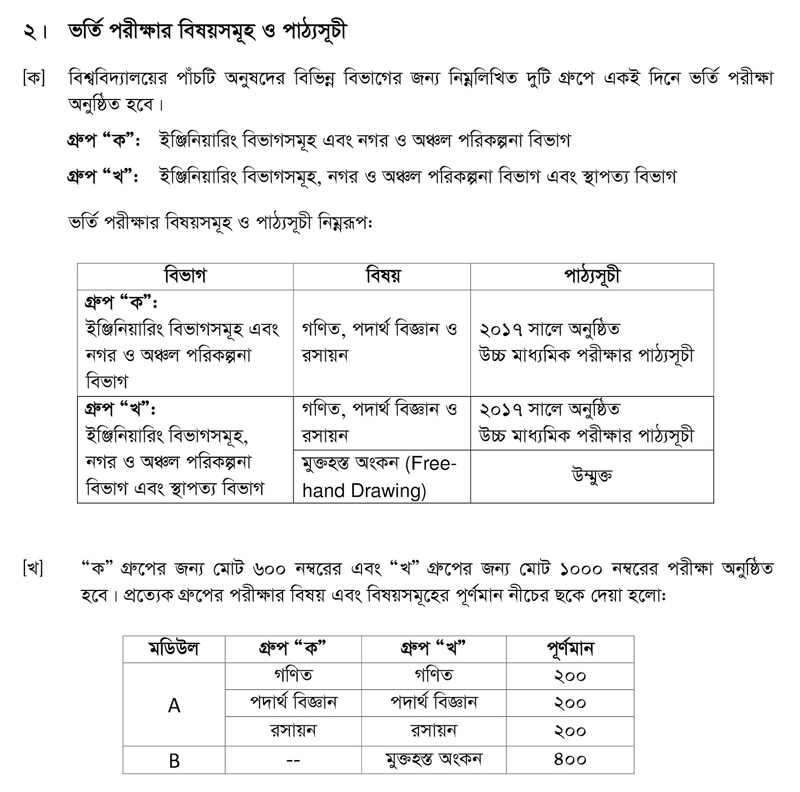 Bangladesh University of Engineering and Technology (BUET) Test admission authority will published http://ugadmission.buet.ac.bd/. 04 November, 2017 will published Admission Test Result. 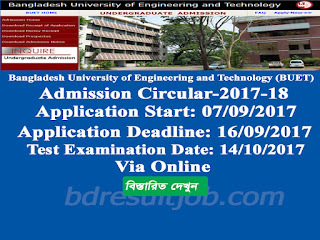 Any applicant can download and view from Bangladesh University of Engineering and Technology (BUET) official website http://ugadmission.buet.ac.bd/ search their Admission Test Roll Number. Tags: ugadmission buet ac bd, www buet ac bd, Bangladesh University of Engineering and Technology (BUET) undergraduate Admission circular 2017, Bangladesh University of Engineering and Technology (BUET) undergraduate Admission circular, Bangladesh University of Engineering and Technology (BUET) undergraduate Admission Test Result 2017, Bangladesh University of Engineering and Technology (BUET) undergraduate Admission waiting list Test Result 2017, buet Admission Circular 2017-18, buet Admission Notice 2017, buet Admit Card Download, buet Seat Plan, buet Admission Mark Distribution 2017, buet Admission Mark Distribution and Syllabus 2017, buet Admission Mark Distribution 2017 Mark Distribution, BUET Admission Test Result 2017, BUET Undergraduate Online Application 2017. Bangladesh University of Engineering and Technology (BUET) undergraduate Admission Admit Card Download 2017.